It’s my pride and honor to announce not only is Surfeit for the Senses coming out next week, completing the Appetite series to date, but all three novels are on sale! 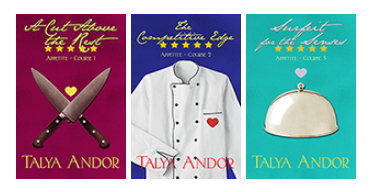 Less Than Three Press is celebrating next week’s release of Book 3 (the last in the series) of the Appetite series by Talya Andor (that’s me) by offering all three books for 20% off! (Note that book 3, Surfeit for the Senses is preorder-only at until 07/24.) The sale price is available all this week and next, so get your copies of A Cut Above the Rest, The Competitive Edge, and Surfeit for the Senses by July 28! So what are you waiting for? Pick up your copies now, and save big time. Also in the works: next week is the final Tour de Foodie to celebrate Surfeit for the Senses‘ release. What do YOU want to hear about Alex and Nik that you haven’t learned already? What cooking secrets would you like to learn, or recipes would you like to see? The whole series! I have read it and I can’t simply describe just how little I knew of food before AND how fascinating I found the process of it to be. Not to mention that Alex and Nik are simply perfect for me and the dynamic is explosive yet edge of your seat. Talya is a friend of mine and I have enjoyed all her stories, plus she never disappoints. Rose, you’re too kind! 🙂 Thank you for your lovely comments.I’m so happy you love the series this much! I doooooooo, very much! These guys are just so special in many ways.